Не забывая про удачную концепцию G6, LG выпустили новое поколение музыкальных флагманов серии V. Новинка лишилась второго дисплея, но приобрела множество других интересных функций и технологий. Summing up the 17th year, I want to mention just one important and obvious trend in smartphones — Frameless design of devices with a display aspect ratio of 2 to 1. It all began with the exhibition MWC 2017, where LG G6 was presented with a FullVision screen. A smartphone is good, but not perfect. Therefore, in September the Korean brand introduced one more flagship - V30. 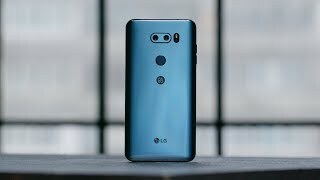 In European countries, the smartphone is called LG V30 + due to the increased amount of internal memory up to 128GB..
And sells for $ 999: in black, blue or purple..
What do we get for such a high price? First of all — FullVision-display. Last year's model (V20) was distinguished by a second small display, which was located above the main one: this idea was abandoned and company returned to successful concept G6. The novelty has a 6-inch display with a resolution of 1440 × 2880, 538 dots per inch,. The ratio of the sides is 18 to 9 (or 2 to 1). Matrix OLED - all layers is protected by Gorilla Glass 5. The display occupies 81% of the front surface of the smartphone. I must say that the screen is good: in the settings you can select the resolution to increase the autonomy. And, possibly, speed of the device. The "Screen color" menu looks unusual: normal, for movies, for photos, for the Internet. Here you can add your profile, and there is also a color enhancement setting in the video. We do not interested in “toxic” picture, therefore we choose "For the photo" or "For the Internet," and get the nice calm image..
By the way, I note the almost perfect white color, very natural without deviations in blue or red..
Obviously, the function "Always-on Display" has not gone anywhere, but it becomes better (with fine-tuning the content)..
You can choose different screen options, to increase the brightness, but the main thing is that you can set the "Always-On Display" mode on and off..
For a long time I waited: who will first think of turning it off at night? It's convenient! Perhaps, it is necessary for someone. The main thing is that there is a choice, and it's very good. What else can you say about the display? As befits a flagship there is support for the HDR10, You probably want to know: is it the same display as in Pixel 2 XL? Well, in Pixel, as it turned out quite a good display, and the whole situation with screens are overexcited. Display with the same technology, but the display itself is different, it's a little better. At the corners it goes a little to green or red color like any OLED, but the deviations are very meager. Overall the display is excellent. The novelty is made of metal and glass. The smartphone feels better in your hand than it looks. The case is protected against dust and moisture according to IP68. The arrangement of the elements is familiar for LG: on the left is a volume button, on the right is a SIM card slot and SD up to 2TB,. Below the microphone, speaker and USB-C, at the top is another microphone and mini-jack (Great!).. Behind the dual camera with sensors and flash, a fingerprint scanner with a button, the logo of LG and Bang & Olufsen.. According to the tactile sensations everything is fine, good ergonomics, there are no complaints, lightweight device. Is that a little bit slippery, but you can take a case for this. An important feature of the smartphone — dual camera. Not like everything else. Main dual camera: the first 13 mp wide-format optics, we'll talk about it yet, second 16-megapixel with aperture F / 1.6 – it is a record aperture among smartphones for today, and in the evening: photos and videos are not as “noisy” as, for example, on the iPhone X. We'll talk about the quality of separately yet, but the “noise-gate” is very good. The second eye of the dual camera is not monochrome and not even tele-, 13 mp wide-angle optics with a viewing angle of 120 ° and aperture F / 1.9.. The lenses are made of glass. The camera copes well at night, you can shoot with a wide angle, there is a 3-axis optical stabilization.. The maximum video resolution is 4K. There are many modes in the camera settings, : panorama 360, slow-motion, timelapse, "Food" mode, collage of two pictures and so on.. It sounds very beautiful, and in fact the camera is really good, especially in case of sufficient illumination. It should be understood that no one has such a wide viewing angle as LG V30 and such aperture ratio. And it's cool..
One of the interesting features of the camera - “Point Zoom” function which allows you to select a specific object that will always remain in the frame when you zoom in..
And it works well after all! There is also the function Cine Effect: different color movie effects for shooting video. The front camera completely forgotten in 2014 - 5 Mp with aperture F / 2.2 and a wide-angle of 90°.. It shoots ordinary, but again - the main feature is a wide optics. LG V30 + has a whole bunch of other advantages. Series V differs from others by the sound quality. In this model: 32-bit 4-channel Hi-Fi SABRE ES9218P with preset sound settings.. The same chip was used in G6 and V20, so the sound of the smartphone is absolutely the same. the sound quality is the result of B&O's work, hence the logo on the back of the smartphone.. The kit also has their headphones in the fabric braid. The sound is very good, so Hi-Res-audio is required for listening. There are also manual settings for it. As for the external sound: the speaker is only one, and it's loud enough. Bonus - there's a radio. You need to connect the headphones to activate it: you can save any stations. I will not deny that I sometimes listen to radio stations in the morning, but through live broadcasts on YouTube. Here a bit outdated format for radio. All the most important things were told, now let's talk about essential details: The flagship processor is Qualcomm Snapdragon 835, 4GB RAM (LPDDR4X),. Constant 128GB UFS 2.1 There are no claims to the hardware, everything is fast and without brakes. In AnTuTu gain about 160,000 points. Yes, it is clear that the frequencies are lowered, but after 5 tests in a row the result remains absolutely the same,. Ie. throttling is not even the slightest, it does not exist. There are no problems with games, everything goes at maximum settings This is 835 Snapdragon. Is there any heating? V30+ pleased us - this is one of the most "cold" smartphones of the 17th year,. If not the "coldest" one. It warms up not simply in the framework of propriety, but generally, it’s imperceptible. This is 100% gaming smartphone. Autonomy. Let's talk about it. The battery is 3300 mAh, there is a Quick Charge 3.0 - from zero to 100% for 1 hour 45 minutes..
Suffices for a day of active work. Nothing surprising. But, most importantly - there is a wireless charging standard Qi. Little features: there is NFC, and hence support for Android Pay. Bluetooth version 5.0, SIM-cards work in networks LTE 4G CAT 16,. There are all necessary bands in Europe, there is also support for VoLTE. And the most pleasant - GPS support, Glonass, and Galileo satellites.. There are always some problems with location recognition on Android devices. The iPhone in this regard is much better than Android, it's a fact. But specifically here - all is very good. Maps almost always show the exact location and direction, plus the direction of the compass. Respect. V30 + работает на Android 7.1.2 с проприетарной оболочкой LG UX6. When it will be updated to Android Oreo - unknown, but they promise in the near future. We're already told about the shell a lot — design, square icons, it's for an amateur. But this time it is worth noting that the phone is very fast. (despite 4GB of RAM). It works much faster than Galaxy Note 8 and Huawei Mate 10 Pro, which is a serious point. From the features, it can be noted: the screen is turned off by a double tap on the screen. Turns on/off. The weather may be displayed on more lock screen: for example, it's snowing, it's raining - and we see drops on the screen. It's useless, but funny. A lot of options for unlocking a smartphone - in addition to the standard password and fingerprint scanner, you can use your face or voice. It tunes quickly, and it works lightning fast. V30+ is basically the maximum from the Korean company this year. We will see the next flagship only in 2018 and nobody knows what it will be. As for this smartphone - it has an excellent screen, excellent camera and DAC for true connoisseurs of sound. For the smartphone from store LG will give you a half-year subscription to the services of Yandex.Music and online cinema ivi.ru.. In general, the smartphone really stands out against the background of competitors, but the price, of course, is too high. But on the other hand and there was not found some of serious minuses, and the flagship must match the flagship price. It looks solid and beautiful - I recommend it. - "LG G6 not bla... bla-bla" - "🙈🙈🙈" - "Hint, pictures, food ..." *What? * - "Hey guy, do you have Type C?" - "The terrible story of Stas..."